It's a common sight around California's wetlands: tall, long-legged, long-necked birds wading in the shallows, looking for fish. Even after years of living in California, I can't resist that moment of awe when I see them. If those long-legged beauties are white, they're probably egrets. The handsome gray ones are herons. They're often found together. So many people live near the coast in southern California that you won't find many places to watch herons and egrets there. Most of the best spots are in central and northern California. They're listed in order here from north to south. Audubon Canyon Ranch on the edge of the Bolinas Lagoon is a favorite nesting spot for herons and egrets, who love the trees on its hillsides. It's just off CA Hwy 1 about an hour's drive north of San Francisco. During nesting season, it's a sight worth seeing if you love wildlife. The trees seem to have more birds in them than leaves, and the babies are adorable. The ranch is open on weekends and holidays only, from late March through early July — or Tuesday through Friday by appointment. Docents are on hand with spotting scopes set up, ready to answer your questions, making this an especially good place to see them. The shallow waters of Elkhorn Slough at Moss Landing are a perfect place to see herons and egrets any time. The slough is about 1.5 hours' drive south of San Francisco and about a half hour north of Monterey. Often, all it takes to see birds in this area is a glance out your car window. To get a better look, you can kayak in the slough — either by yourself on a group tour — or go on a naturalist-led boat trip with Elkhorn Slough Safari. 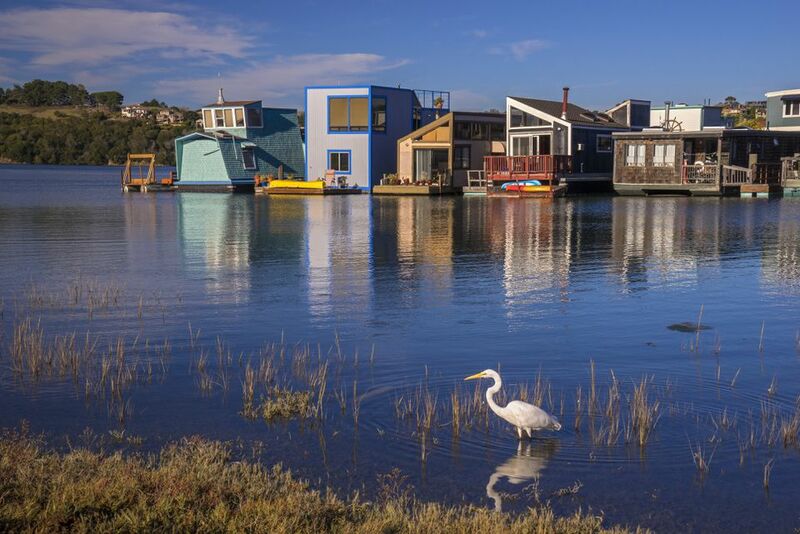 More than 7,000 acres of land around Elkhorn Slough are protected by conservancy organizations. You'll find a visitor center a few miles off CA Hwy 1 where you can learn more and explore the marshes on foot. To get there, turn at the power plant onto Dolan Road, then left onto Elkhorn Road. Gray Lodge Wildlife Area isn't on the coast but in the central valley, 60 miles north of Sacramento in Butte County. Located on the Pacific Flyway, it attracts almost 40 kinds of water birds and provides winter habitat for approximately 5 million birds every year. Besides the more common great blue herons and great egrets, you can also see green herons, black-crowned herons, little blue herons and snowy egrets at Gray Lodge. California Watchable Wildlife lists more places to see great blue herons and egrets. They include K Dock near Pier 39 in San Francisco, the Audubon Kern River Preserve northeast of Bakersfield and the Palo Alto Baylands Preserve on the San Francisco Bay. If you want to be sure you correctly identify the birds you see, check the species ID pages at the Cornell Lab of Ornithology. To identify them on the go, I like their Merlin Bird ID app, which is available for both iPhones and Androids. Don't get too close to the birds. Stay at least a quarter mile away when they're nesting, so you don't disturb them or their babies. Bring binoculars or a birdwatcher's spotting scope. You can see them better. Photographing moving birds is difficult. Practice "panning," — following birds with your camera — before you go and remember: don't stop following when you press the shutter. If you're photographing the white egrets, set your exposure slightly lower than normal to avoid losing detail in those white feathers. Herons and egrets are free-ranging, wild creatures and sometimes they just don't show up, no matter where you are, who you are, or how much you want to see them.